Restorative yoga is an excellent opportunity to disconnect from the hectic activity of daily life and let your speedometer return to 3 mph. It offers a welcome respite among all the turbulence of life and helps to prepare the mind and body for the inward stroke of meditation and deepened awareness. 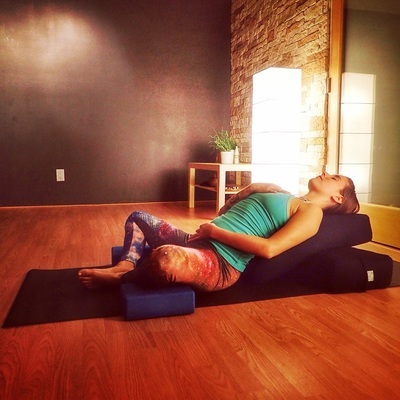 A restorative practice frequently relies on the use of props (blankets) and holding of a few simple poses to achieve a deep level of relaxation. The focus is on breath, and a guided meditation is common. “Restorative yoga” can also be an umbrella term that encompasses several sub-styles of relaxation and healing-based Hatha yoga practices, such as the Seven Spiritual Laws of Yoga. This is an incredible system to heal the body. Restorative yoga induces the relaxation response, balances the nervous system and optimizes the energy flow to the organs. It improves immune function and enhances the process of digestion. Basically it sets the whole body up for deep healing, growth and repair. Beyond incredible physiological health benefits, restorative yoga creates the opportunity to see where you hold habitual tension so that you may release it. In restorative Yoga a series of mind, body, and awareness techniques that will take you into a deep experience of integrated relaxed awareness. It is a powerful tool for awakening as well as helping people to live happier, healthier lives. In this form of yoga you will move slowly, and remain in postures for a few minutes while allowing thought patterns, emotions, sensations, and images to arise and pass. Brain activities slow down and allow energy to move freely throughout the body. Being present in these postures can assist the body in recognizing and benefiting from deep relaxation which in turn can help you fall asleep and stay asleep. It relieves insomnia by allowing you to disengage from thoughts and other stressors and to experience deep relaxation. Insomnia? Science defines insomnia as repeated difficulty with the initiation, duration, maintenance, or quality of sleep that occurs despite adequate time and opportunity for sleep and results in some form of daytime impairment. Come join us for your first session free and experience deep relaxation and stress relief. Semi-Private class is on Saturdays at 9:00am.